Once, the dusty African air hereabouts rang with war cries and musket fire. These days, in July at any rate, you're more likely to hear a chorus of 'DAAHLINGS!' The historic South African town of Grahamstown was founded as a British fort in 1820 during the fierce frontier wars with the Xhosa tribes in what is now the Eastern Cape. In that year, twenty-four ships from England left for Algoa Bay, their passengers lured by promises of free passage and prime agricultural land.Upon arrival, however, they learned that the Zuurveld wasn't called the Sour Land for nothing. Moreover, they discovered they were to be a buffer between the warlike black tribes and the newly entrenched European colony.The new arrivals duly swelled the colonial population until gold and diamonds were discovered inland and the town's improving fortunes proved to be a flash in someone else's pan. Today, Grahamstown's place on the map is assured by two things: Rhodes University and the Standard Bank National Festival of the Arts held every year in July.Little-known Grahamstown is a fitting setting for what started out as a celebration of South Africa's English heritage only to become Africa's largest Arts Festival. This is an event with a capital 'E'. Only the Edinburgh Festival is bigger.Upon arrival, the visitor could be in any 19th century English university town. Victorian houses, Gothic cathedrals, settler cottages and old English pubs help stage-manage the illusion.The erstwhile 1820 Settlers Monument squats in monolithic sandstone above the city, much like Edinburgh Castle. There are other similarities between this African festival city and its more famous European cousin.Edinburgh's past is mirrored in its twisted cobbled streets; the unlikely stairs that erupt from innocent street corners and the arches and statues that adorn preserved Victorian tenements. Replace the cobbles with streets wide enough to turn an ox-wagon and you've got Grahamstown.Known as the City of Saints for its many churches, the High Street is dominated by the Cathedral of St Michael and St George. The spire is the largest structure for miles around; its only rival, the giant pineapple in nearby Bathurst which leaves any sightseer in no doubt as to the principal farming crop in these parts.Prickly pears come a close second. Pineapples and prima donnas may seem a strange brew but for ten heady days in July the rustle of books and tussle of harvest is upstaged by greasepaint and sequins. Here, upon this historical battleground, Europe and Africa collide, in a jarring, jostling, jamboree of Africa's past and present.Here, too, the future is being forged. Don't expect to get much sleep.The Festival began in 1974 with sixty-four items including Shakespeare's King Lear, the ballet, Romeo and Juliet, the opera, Cosi Fan Tutti and the prophetically entitled settler play, 'Take Root or Die.' Indigenous contributions ran to art work from 'coloured' schools in the Eastern Cape, Bushman, Okavango and Ovambo handicrafts from Windhoek State Museum and the Royal Lesotho Tapestry Weavers. The foreword to the first programme trumpeted, 'You have come to celebrate the opening of a Monument designed to perpetuate our many-sided heritage.' In light of the government of the day, this was an ambitious undertaking.The Cutting Edge multi-media exhibition at the Festival's 25th birthday, was a forceful reminder of the repression of the past. Copies of the Government Gazette of those years list cultural bans on material as subversive as Pink Floyd's 'Another Brick in the Wall' album and Chris de Burgh's 'Spanish Train'; the musical 'Hair' in its entirety and even the 'Best of Bill Cosby.' 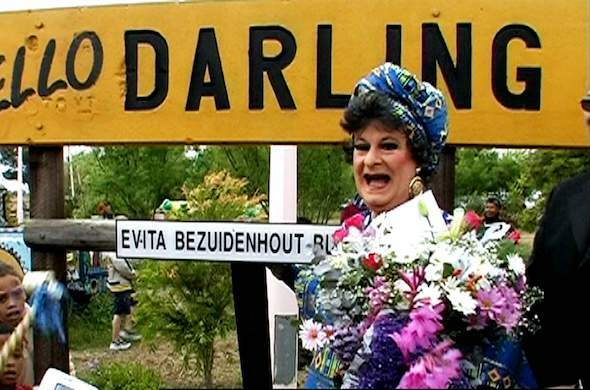 However, throughout those years the Festival attempted to remain true, to a greater or lesser extent, to its founding mission statement and somehow the soapboxes were tolerated.Pieter Dirk Uys, South Africa's foremost satirist and unofficial 'first lady' has been performing on the Festival since its earliest days. He remembers, 'In the past the Festival always had free speech but it was risky. 'He waged a second war, in those early years, against Eurocentricity. 'We were hippies, mavericks. The Festival was an arena to irritate.' The Festival's twenty-fifth birthday at the turn of the millenium, marked a coming of age of his own. His five productions in the thousand-seater main auditorium were all sold out. 'The edges move to the centre and a new fringe forms,' he comments, unmoved by mainstream success.Twenty-five years on and a new-look country later, the Festival is not only a South African event but an international celebration of the arts - a veritable 'supermarket of culture.' 1999 saw over four hundred events showcased on both the Main Festival and Fringe circuit with close on fifteen hundred performances taking place over the twelve days of festivities.The new South Africa paraded its colours in productions like a South African Siddhartha, a stirring masala of Zulu, Xhosa and classical Indian dance with a dash of classical ballet. Continental Africa strutted its stuff with Ivory Coast puppet theatre, the Pan African Orchestra from Ghana and Ugandan New World Music. Street traders from Zimbabwe and Malawi and Tanzanian herbalists solicited business on the streets.International contributions ranged from a Sami throat singer from Lapland to Czech experimental theatre, the Netherlands Dance Company, French circus theatre and Andelusian flamenco. Like the cosmopolitan content of the shows, the audiences too have become more colourful. Vignettes of the new South Africa are everywhere. Neatly uniformed high school kids, black and white, share an ice cream. A white woman walks by, black child draped over her shoulder. A barefoot street urchin rediscovers African rhythm on white hippie drums.Yet at the camera obscura museum, we meet the local guide. The winding wooden stairs of the viewing turret has done little to reduce his comfortable shape in the last twelve years. According to him, 'Nothing's changed in twenty-five years.' Up in the turret, watching real-life/ real-time reflections in a white convex bowl - High Street below and the townships on the outskirts - as people were doing in just this spot, a hundred years ago, I can believe him. Time, in Grahamstown, wouldn't dream of running the lights.Speak to a local artist, however about the changes time and a new dispensation has wrought on the Festival and you'll get a different perspective. Lennox Faba is a man who grew up in the townships of Grahamstown and now sits on the Festival Board as an elected representative of the Grahamstown Central Forum for Arts and Culture.A choreographer of Xhosa traditional dance, among other things, his 'Isizweni' recently won a Gold award at the national Eisteddefod. The conditions in which he works are unthinkable to a western artist. He staggers his rehearsals in order to fit his dancers into the 2 to 3 metre rehearsal space which is all he has in which to work.Transport is also a problem from the carefully planned, far-flung townships to theatre venues in town. Often, he has to cadge lifts from obliging policemen, themselves also short of vehicles. While he agrees that up until now the Festival has had little direct benefit for the local community and that it doesn't yet reach into the townships, he is upbeat about the progress being made. 'Before 1994', he says, 'there was no awareness of the Festival in Rini but it started generating interest with the advent of popular musicians like Bayete and Rebecca Molope. 'Now there is Dakawa, a business training ground and showcase for local artists; the Studio where the best of local stage-talent is spotlighted and the Playhouse Theatre's free stage where township residents flock to watch traditional dancers in warrior skins pound out rhythms to make a white suburban madam blush.Faba asserts, 'The Festival has to have all the colours of the rainbow and the will is here, the commitment to make it more colourful and representative. I've never had a white friend before. Now, I'm beginning to have lots of white friends. The festival could become a unifying force in South Africa. Politicians have failed to unite the people but the Arts have done it.' 'But, we need to make the Festival everyday. I have a vision of Rini in three years time where each and every citizen will be holding the Arts. It is our duty - the people who live here - to make sure the streets are buzzing.' And for those two weeks in July, buzz they do.Tens of thousands of visitors descend every year and the whole town is pressed into service. School and church halls, university residences and even car showrooms are used as venues for the art, music, drama, cabaret, films, lectures and workshops which vie for the limelight. Fly-by-night bistros spring up in schools, sandwich dens huddle under the Drostdy Arch, coffee shops bloom down side alleys and cafes spill onto the street.Over on the Village Green, Woodstock lives on in the thousand stalls of the Craft Fair. This is tie-dye territory. Rain sticks and rain gods, fetishes and flares, buskers, bohemians and beggars abound. Manicured matrons are eclipsed by their teenage daughters in flowing tresses and face paint. The Rastafarians in their dreads and burlap are not keen to be photographed. Three township teenagers, however, pose in front of some well-wheeled festival-goer's prodigious Mercedes. Proceedings are called to a halt as one reaches for his sunglasses and applies the finishing touch before the flash goes off.Posters decorate every available space; they daub trees, walls and even the pavement underfoot. One house has put up its own posters pleading a case for its newly-painted walls. Miraculously, a week into the Festival and it survives unscathed. But not for long. By the next morning, the virgin canvas has been deflowered - the nocturnal ravisher, a spray-can artist known only as DOOG.Seditious creativity has long been the Festival's speciality. As for the future, in the words of sedition's (and the new South Africa's) chief proponent Pieter Dirk Uys, 'If we don't fall off the bus with a speed wobble, in five years time we'll be the most amazing country in the world.' The same might be said of the Festival.Copyright © 2002 Laurianne Claase. All rights reserved. Reproduction in whole or in part without the permission of the author is prohibited. Pieter Dirk Uys, South Africa's foremost satirist and unofficial "first lady" has been performing on the Festival since its earliest days. He remembers, "In the past the Festival always had free speech but it was risky." The historic South African town of Grahamstown was founded as a British fort in 1820 during the fierce frontier wars with the Xhosa tribes in what is now the Eastern Cape.